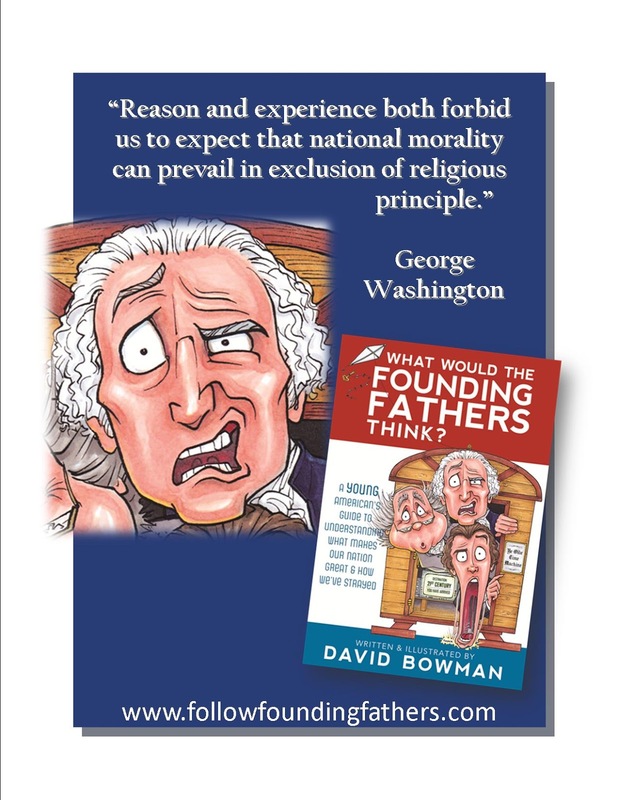 Book Review – What Would the Founding Fathers Think? In honor of President’s Day, let’s take a moment to reflect on the history of our nation. Now, let’s think about where our nation is today. I am of the opinion that our nation is not quite like the first presidents envisioned it to be. What do you think? And what would the founding fathers think about our nation today? What Would the Founding Fathers Think? was written by David Bowman. David Bowman is a Christian and conservative who enjoys art, books, and motivational speaking. 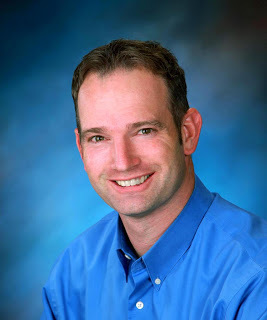 David also writes and illustrates books for young audiences, combining his cartooning skills and his background teaching at a high school level, he is able to engage and entertain teen readers with wit and cartoon-style illustrations. Some of his titles include: Who’s Your Hero series, The Great Plan of Happiness, Dude Don’t Be a Lemuel, and What Would the Founding Fathers Think? Here’s a book that presents the history of our nation, outlining the intentions of the founding fathers when they first drafted the Declaration of Independence and the Constitution. What Would the Founding Fathers Think? is written to kids (especially in the preteen and teen age range) in today’s language and with fun, cartoonish illustrations. 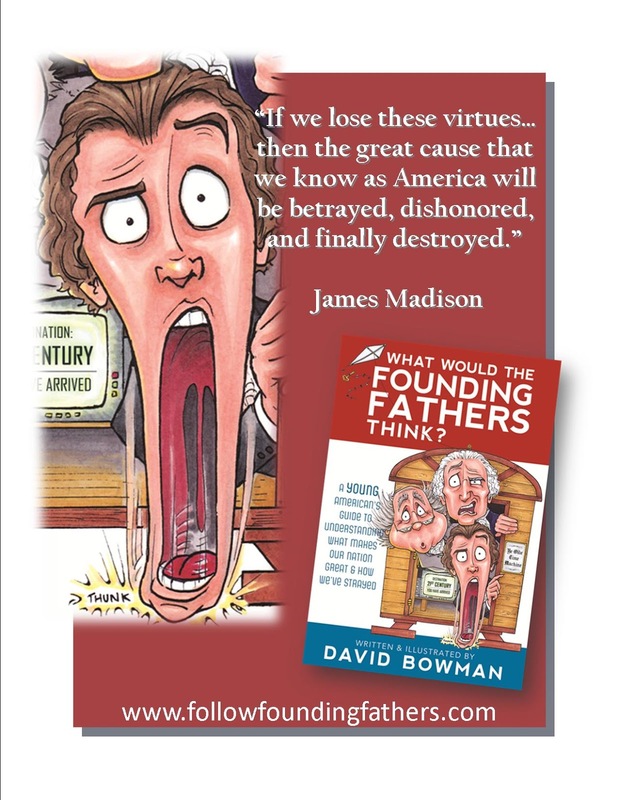 The book is written from the perspective of George Washington, Benjamin Franklin, and James Madison. In the story, Franklin has built a time machine which allows the men to travel into the future for a peek at America today. Through a humorous Skype and Chat session with the youth of today, the founding fathers outline what they believe to be the problems with our society, comparing it against their original vision. The United States of America was and is the greatest nation on Earth. Today the United States of America is in serious trouble. You will inherit the USA-and its problems-in just a few short years. The first section of the book uses a pyramid to illustrate the distribution of power as the founding fathers intended. In this pyramid, God and Religion are the foundation with individuals who self-govern and a limited government as a result. 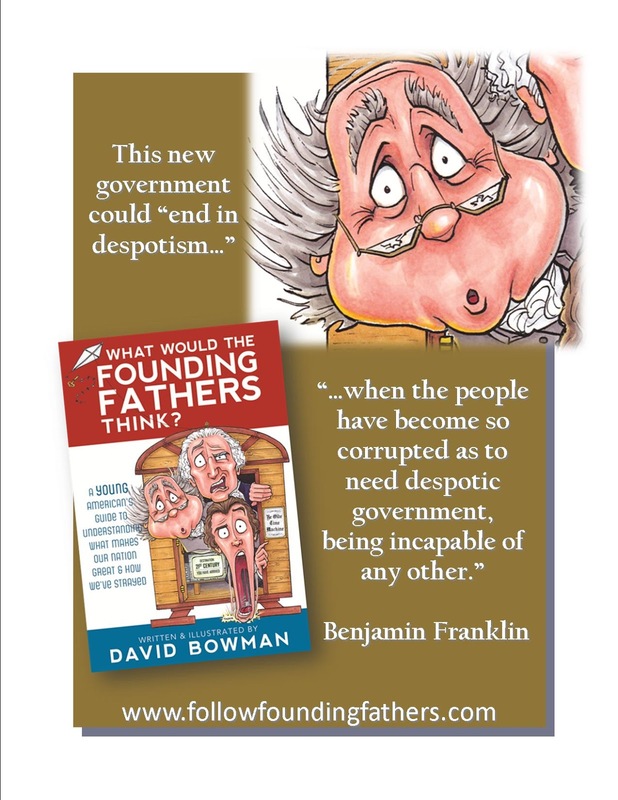 In the second section, the founding fathers explain how America has strayed from their original vision by becoming upside-down with the government being the most powerful entity and God and Religion as greatly diminished. The book ends with suggestions for what the youth of today can do about the direction of our country. Advice such as learning to govern yourself and developing character are some of the ideas listed. The author encourages the reader to “do something” to make a positive change. I really enjoyed reading through the book myself. It was an excellent tutorial of our nation’s history, the Constitution, and our government. The information was clearly written for youth but still contains depth, making it an informative read even for adults. I learned quite a bit about the intended structure of our government and the current structure of our government. 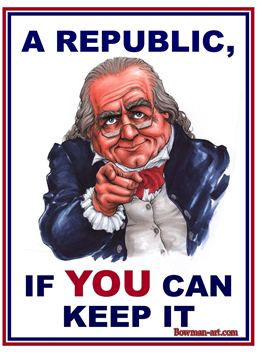 I loved the cartoonish illustrations of the founding fathers. The clever pictures added so much to the text. I loved seeing the author’s perspective of the founding fathers’ thoughts on our society today. The book is written in a conversational style. This makes it easy to read-and a quick read as well. It’s one that you would want to read multiple times so as not to miss any of the wit in the dialog or miss any of the detailed illustrations about government structure. I read bits and pieces of the book to Curly who was able to understand quite a large amount of the information. She especially loved the illustrations of the founding fathers and the many comical expressions on their faces. But I think both of our favorite parts of the book were the scenarios used for illustration purposes as well as the diagrams. Those pictures and diagrams really helped both of us picture the structure of government today and contrast it with what the founding fathers intended. In addition, the real-life scenarios helped put the historical information into a present-day context. It’s pretty exciting when a young child can understand more about the history of our government and even mom can learn something too. We’ll keep this book and refer to it often as we study both history and government. 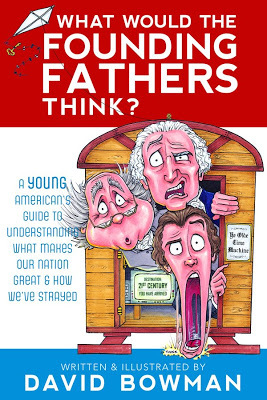 I recommend What Would the Founding Fathers Think for conservative parents who want to begin teaching their children about our nation’s history and government. Images courtesy of David Bowman Blog Tour. Disclaimer: I received a free copy of this book in exchange for an honest review. I was not required to write a positive review nor was I compensated in any other way. All opinions I have expressed are my own or those of my family. I am disclosing this in accordance with the FTC Regulations. ← Time for a Toddler Bed!